SMU Mustangs and Houston Cougars play this Saturday in Houston. Houston is unranked, and of course wants to stay that way. This is a great gameday matchup and promises to be the "game to watch" on Saturday. I don't think either team will disappoint us with a boring game, similar to what happened a few weeks ago (*COUGH Alabama *COUGH LSU)!! The hubby and I will be at the OU vs Baylor game so hopefully I will get some fun gameday pics of that game. 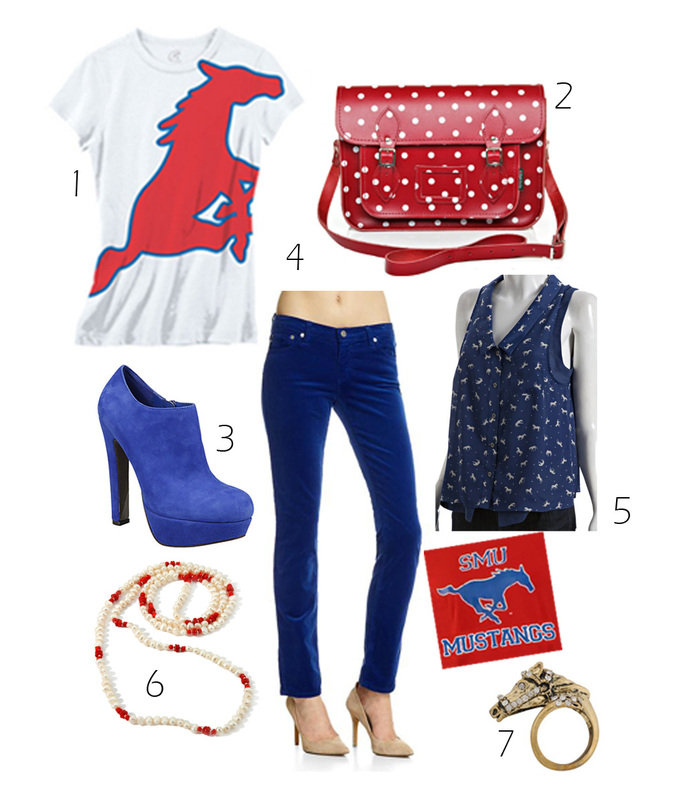 In honor of the SMU girls, I have put together a few stylish red and blue pieces. The AG cords (4) look so comfy and the blue BCBG top (5) is mayjorly cute with the tiny horse print. Cheers! Happy Gameday!